Besana argues that appointing the COA Chief to the post of Associate Justice of the SC would be ironic and a contradiction in terms, for the Disbursement Acceleration Program (DAP) was UNANIMOUSLY struck out by the High Court as UNCONSTITUTIONAL, but here is COA Chief Tan who not only allowed DAP’s illegal disbursements to the legislature, she also let it flourish unchecked in the mind-boggling magnitude that shocked the High Court in its July 02 ruling. The appointing power is President Aquino and unfortunately he does not seem to care any longer at this point if the Filipino people objects to Tan---just as there are reports that he would appoint the highly partisan Justice Secretary Leila de Lima as Comelec Chair with the retirement of Sixto Brillantes on Feb. 2, 2015. What’s truly sad is that P-Noy, in the twilight of his presidency, appears to be obsessed only with consolidating the LP’s hold on power and influence, obviously to protect himself from an a la GMA scenario--- never mind, it would seem, if institutions supposedly non-partisan and constitutionally guaranteed of independence, such as the SC, COA and Comelec would be compromised. In a nutshell, former State Auditor Besana’s argument against COA Chief Tan is: how can she be appointed to the SC when it has just declared as unconstitutional the DAP that Tan had been instrumental in allowing the Executive to arrogate illegally to legislators? This happened after DBM Secretary Florencio Abad issued his unconstitutional National Budget Circular 541 on July 18, 2012. As lawyer-CPA Tan should have known that such cross-border transfers, in the memorable imagery of the SC ruling, were unconstitutional and she should have ruled them out. As SC Justice Arturo Brion pointed out, DBM Chief Butch Abad could not have known about the illegality of DAP and his NBC 541---as a lawyer and with at least 12 years of experience behind him as a congressman, who even chaired the committee on House Appropriations. But never mind Abad, for he was even the mentor of scam lady Janet Napoles and now he is utterly loyal to P-Noy. But Pulido Tan, as Besana asserts in Tribune, was even warned about the illegality of Abad’s circular and DAP by then COA Accountancy Office Chief and Assistant Commissioner Jaime Naranjo, and that it is a violation of the Constitution. Instead of checking Naranjo’s opinion within executive circles, however, and perhaps commending her subordinate for his forthrightness, said Besana, boss-lady Tan not only ignored Naranjo's opinion but cold-shouldered him. In fact their relationship soured to the point that Naranjo decided to apply for early retirement and now lives somewhere in Mindanao. In effect, said Besana, Tan’s circular installed a “spy network nationwide,” in every sector, national, local or corporate audit unit, in its every office and audit unit personnel---thus, he claimed, making it impossible for anyone to inquire on the status of audit without first informing the COA Chair. It’s interesting to recall that Grace Pulido-Tan was a longtime protégé and associate of the Finance Secretary Cesar Purisima in the GMA administration, and when Purisima engineered the mass resignation of the Hyatt 10 group in July 2005, Finance Usec Pulido Tan resigned with them. When the P-Noy administration came into power Purisima persuaded her to take the COA Chair’s post. Now Hyatt 10 officials are ferociously clinging to their various posts amid the gargantuan corruption charges, their lips sealed. He cites among the “shameful incidents” the impeachment trial of Chief Justice Renato Corona, the scenario in Cavite between Secretaries Mar Roxas and Butch Abad and Sen. Bong Revilla, and the allocation of P143.7 million in DAP funds for COA’s equipment, consultants and vehicles at Tan’s explicit request. COA Insiders, however, reportedly decried that Tan’s plea for such requisites as new vehicles has no merit since the central office “can be seen as crawling with brand new cars and all sorts of vehicles assigned to directors and unit heads”. I must say that I admire the courage and forthrightness of former State Auditor V Arturo Besana to come out against COA Chair Pulido-Tan and Deputy Commissioner Heidi Mendoza, whose appointment was finally approved by the Commission on Appointments before Congress’ recent adjournment after four years of pendency. Besana has an interesting point in decrying COA Chief Tan’s role in DAP. He argues that in the case of Sen. Bong Revilla, Tan made him bite the (DAP) apple by allowing it to flourish under Abad’s National Budget Circular 541 (which the SC justices denounced as “castrating the power of the purse of Congress’”). Now, suddenly, says Besana, Tan says that Revilla committed the ‘original sin,’ when that distinction belongs to her and Abad. What’s interesting about former State Auditor V Besana’s expose is that Abad issued NBC 541 institutionalizing DAP on July 18. 2012, just a month and a half after the conviction of CJ Corona in the Senate. Recall that then Senate Finance Chair Franklin Drilon wrote the letter to the senators before the conviction voting, advising them of the availability of DAP for their projects---clearly based on Abad’s circular. Those documents were part of the Palace’s grandiose bribery scheme of the senators. What is just as interesting is Besana’s tirade against Heidi Mendoza who was enshrined as a resurrected Joan of Arc by some media after she made some seemingly courageous accusations against President Arroyo in her last weeks in office. In this current administration, however, she has been in charge of overseeing the audit of national and local government agencies and corporate and international bodies---and yet, not a pipsqueak of protest from her on the unconstitutional DAP. 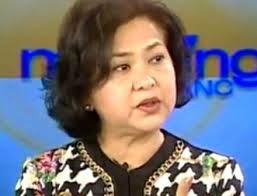 At the Senate trial of CJ Corona, Ombudsman Conchita Morales, testifying against his foreign account, showed a power-point presentation that made it appear that each foreign deposit of Corona was a new account altogether---making the aggregate amount seem so huge (in the vicinity, she said, of $10 million!) that Corona sought to rectify the error in another session. Morales admitted that it was Heidi Mendoza who helped her with the research! With reports of the impending appointment of Justice Secretary De Lima to Comelec’s helm vice retiring Sixto Brillantes, Grace Pulido Tan to the SC vacancy, Heidi Mendoza to COA’s helm vice Tan, and Morales remaining as Ombudsman, the four female Musketeers for P-Noy are complete. What astounds observers is how P-Noy manages to wreck all the institutions that have been guaranteed by the Constitution to be independent from all angles.